"Thomas, called Didymus, one of the Twelve [apostles], was not with them when Jesus came. So the other disciples said to him, "We have seen the Lord." But he said to them, "Unless I see the mark of the nails in his hands and put my finger into the nailmarks and put my hand into his side, I will not believe." Now a week later his disciples were again inside and Thomas was with them. Jesus came, although the doors were locked, and stood in their midst and said, "Peace be with you." There is a popular saying:-"For those who believe, no explanation is necessary. For those who do not believe, no explanation is possible." -Author unknown. Perhaps for some such a statement is indeed true, but for those who may be skeptical of God and His works, but at the same time have an open mind and heart like Thomas the Apostle for example, the truth can indeed penetrate and take root. 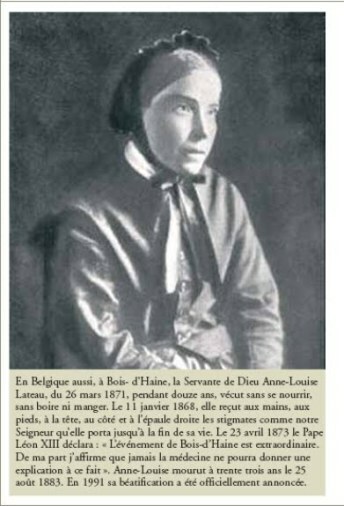 And so, for those who are skeptical or unconvinced of God and of the supernatural graces that He bestows upon certain souls, I offer below the medical and scientific testimony concerning the extraordinary supernatural gifts given to a Belgian girl named Anne Louise Lateau. What makes the case of Louise Lateau so unique is not only the extraordinary mystical graces that she received from God, but the fact that her case was thoroughly investigated and studied by many Physicians, including one of the most eminent Psychological Physicians in Belgium at that time. To make matters even more extraordinary, this highly respected Physician felt duty bound after his investigation to publish an extensive book on his findings, which is the source for this article. Additionally, another respected Physician, Dr. Imbert Gourbeyre, also examined the extraordinary phenomenon in the life of Louise Lateau, and the reader will discover some of his findings particularly in the source book for this article, but also in the document below. 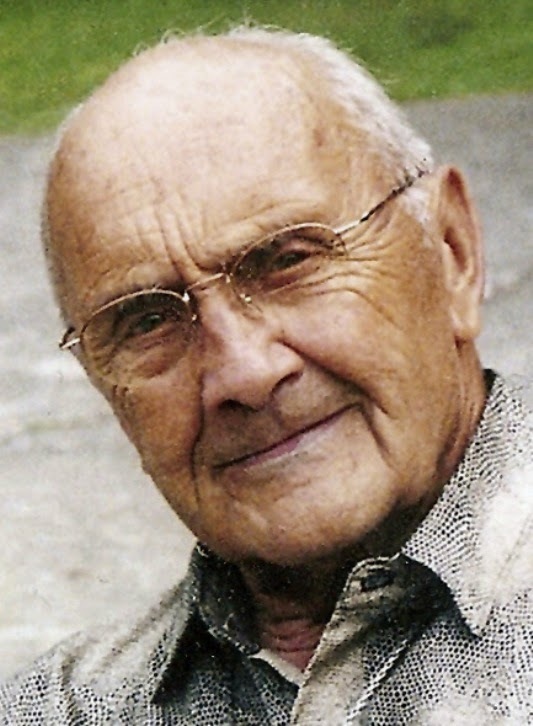 The author and diligent investigator of the life of Louise Lateau, Dr. Ferdinand J.M. Lefebvre, was a Professor of General Pathology and Therapeutics in the Catholic University of Louvain; additionally, for nearly twenty years he had been at the head of the medical staff of two establishments for the cure of mental diseases, during which period he has also delivered courses of lectures upon the same subject; and for many years he had an extensive private medical practice. 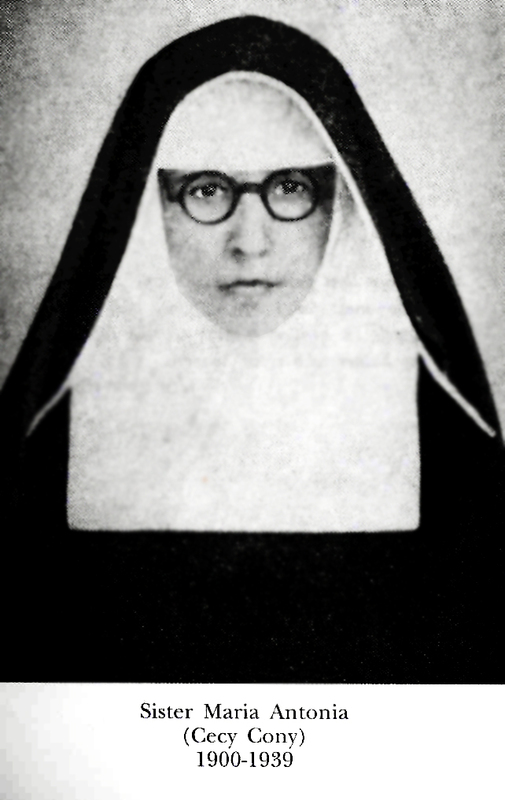 Given his extensive knowledge of Psychology and Medicine, and the fact that he was well respected amongst his medical colleagues, it was the Catholic ecclesiastical authority itself that asked Dr Lefebvre to investigate the remarkable phenomenon in the life of Louise Lateau. “In the spring of 1869 a singular rumour was being spread abroad. The report said that in a village of Hainaut (Belgium) blood came every week from various parts of the body of a young girl. The most remarkable part of the story was that the blood flowed only on Fridays, and always came from the same places,—the left side of the breast, the palm and back of the hands, and from the corresponding places on each foot. A few months afterwards, it was, moreover, said that she was in an ecstasy every Friday; and that this ecstasy lasted through a great part of the day. "The report of the first witnesses of these extraordinary things soon aroused the public ear. Crowds assembled each week around the humble cottage which was the scene of them. Then ecclesiastical authority took cognizance of it. Such was its right, nay, its duty. From the very outset the Church authority saw that divers elements of the case must pass through the crucible of science; for periodical hemorrhage and the suspension of the exercise of the senses were phenomena which belonged to the province of medical men. I was asked to undertake the case. At the same time it was suggested that I should study simply its medical bearings. Therefore I desired to study them deeply, and not to shrink from any test which modern science required, no matter how severe the test might be”…..
Anne Louise Lateau was born January 30, 1850, at Hainaut in a village known by the name of Bois d'Haine, Belgium. 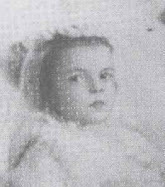 She was the third and last child of Gregory and Adele (Pissens) Lateau. Her father was a metal factory workman. They were of the poor working class, and lived in a small house best described as a cottage. 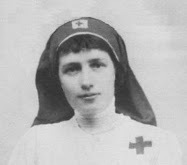 Sadly, Louise father Gregory, although in robust health, caught the malignant smallpox, which was then so prevalent at Bois d'Haine. After a few days' illness, he died on the April 17, 1850. He left three young little girls- Rosine, the eldest, was three years old; the second, Adeline, was two and Louise, the youngest, was only ten weeks old, leaving the mother, Adele, to care for all three of them alone. At age 8, Louise went to help take care of her elderly woman in town who was sick. After having made her First Communion, at the age of eleven years, Louise went to assist her father's aunt, the widow Coulon, an old person of seventy-eight, who lived with her son and his wife at Manage. She spent daytime hours doing household work, and often spent a part of the night watching by her sick aunt, who died two years afterwards, still cared for by Louise. At the death of the old woman, her children recommended Louise to a respectable lady in Brussels; but she only stayed there seven months, as she was taken ill . After a few weeks recovery she was called home by her mother, and has ever since remained there, working as a dressmaker. Such, in a few words, is the humble life of this poor girl. In order to make the reader better acquainted with her, we will rapidly sketch her moral portrait. It has often happened, in my examination of her, that I laid traps to detect her, if I could, in any insincerity, but I never succeeded. One day, for instance, when she came out of her ecstasy, I asked her what she had seen. She related to me in a few words the scenes of the Passion which had just passed before her eyes. I rejoined : ' But what did our Saviour say ?' ' I heard nothing, sir.' ' That's impossible,' I said; ' for we know very well that our Lord during His Passion spoke sometimes to the Apostles, and sometimes to the Jews.' ' I did not hear Him speak.' ' Well, it's very strange; but you will certainly hear Him speak another time.' This 'other time' has never come; she has always told me that she had heard nothing. She loves solitude and silence, and never speaks of the wonderful things which are done in her. She has a few young friends, to whom she has been much attached from her childhood. 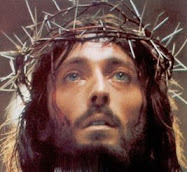 I know from very accurate information, that the subject of the ecstasies and the stigmata is never named amongst them. It is a closed world, into which her most intimate friends never dare penetrate. She maintains the same reserve even with her mother and sisters; and they, on their part, never introduce the subject in her presence. Her character is one of quiet cheerfulness. In many circumstances she has given proof of a calm, patient, invincible courage. I have watched her closely in circumstances still more trying. In the month of November 1868 her eldest sister was attacked by a dangerous and complicated typhoid fever which required the most incessant care during six weeks. Her mother at the same time had been ill for two months with pleuropneumonia,12 the cure of which was rendered slow and difficult by an emphysema of long standing. As these illnesses were prolonged the resources of the family diminished; their life was one of real privation. The younger sister was obliged to work to gain their daily bread; Louise, therefore, had almost the sole care of the two invalids. On foot both night and day, she scarcely slept at all for more than a month. The widow Lateau, irritated by her sufferings, had grown exacting and hard to please; she frequently accused Louise of being the cause of all the misfortunes which threatened to overwhelm the family. I saw the young girl amidst these crosses, this fatigue, this want of sleep, and I always found her the same—placid, calm, smiling. Another striking feature of her nature is her charity. Poor herself, she has always had a passion for helping the poor. 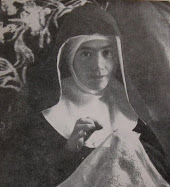 When scarcely more than a child she devoted herself to the care of the sick, with entire forgetfulness of self and unusual tact; even now, when there is a case of serious illness in the village, Louise is sent for, and she joyfully fulfils all the duties of Sister of Charity; when any one dies, it is almost always Louise who prepares the body for burial. In 1866 the cholera, which was prevalent in Belgium, broke out at Bois d'Haine. It cannot be said to have made great ravages there, but, as in many other places, it created a panic and gave occasion to certain acts of cowardice, which one can easily understand, perhaps even excused, but out of respect for human weakness, one would prefer to leave untold, if it were not important to reveal. The plague struck first a working man's family, composed of seven persons. The four sons, yielding to a panic, abandoned the house, leaving their father, mother, and sister struck down by the disease. The parish priest, whose assistance was needed by others, sent for Louise. She took up her abode in the abandoned house, and alone attended upon the father and mother up to their last hour—they died both on the same day; and she continued her kind care to their daughter until•the sons, feeling doubtless some remorse, returned to the cottage for an instant, just to carry their sister away to another house. Thus left alone, Louise laid out the two dead bodies; then, with the assistance of her sister Adeline, placed them in a coffin and managed to carry them out of the infected house. Some men, encouraged by the example of these young girls, then took the bodies to the cemetery. Louise, with the doctor and the priest, continued this work during the whole time that the epidemic lasted. She never left the houses into which the plague had once penetrated; she could not of course be everywhere at once; but she nursed six cholera patients in the month, continually laid out the dead, and even carried several of them to the cemetery. And she did all this when she was a mere child of sixteen. Louise has also shown from her childhood remarkable piety. I must again repeat that I leave this view of the question to theologians; yet I cannot pass it over in complete silence. If I were absolutely to efface from the picture which I am drawing the religious character which is its chief characteristic, the whole aspect of the facts would not only be incomplete; it would be changed and disfigured. I therefore record here my own personal observations. I have been struck by the simple and practical character of Louise Lateau's piety. Free from all exaggeration and affectation, she follows the beaten track, but follows it faithfully. In her interior and religious life, as well as in her exterior, there is an indescribable simplicity, discretion, and moderation, which never abandons her. "The first flow of blood occurred on the 24th of April 1868; this was a Friday. 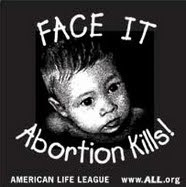 On that day the young girl noticed that blood was issuing from the left side of her chest. With her habitual reserve she said nothing about this occurrence. On the following Friday the flow recurred in the same place; in addition, blood escaped from the upper surface of both feet. Neither did she make public this second incident, but she confided it to the director of her conscience. The priest, though he considered the fact extraordinary, did not wish the imagination of the young person to dwell upon it; he reassured her, and advised her not to speak of it. On the third Friday, the 8th of May, blood flowed in the course of the night from the left side and from both feet. Towards nine in the morning it escaped in quantity from both hands, as much from the backs of the hands as from the palms. It was impossible to keep the fact secret any longer, and the cure of Bois d'Haine counselled Louise to consult a physician. Since this time the bleeding has recurred in the same places every Friday, with certain variations that we will record later on. Finally, on the September 25,1868, the blood, for the first time, came from her forehead. The first symptoms indicative of the approaching efflux (flow) of blood occur on the Thursday, generally about noon… The efflux of blood begins generally in the night, between Thursday and Friday, almost always between midnight and one o'clock. It does not take place from all the stigmata at once, but in succession, and not in any regular order. Most frequently it commences at the side; and at different hours the stigmata of the hands, the feet, and the forehead successively begin to bleed…. At each of my Friday visits I have taken pains to satisfy myself that the left side of the breast was bleeding. I have four times examined the part uncovered, and this is what I have ascertained : the flow occurs at the level of the space between the fifth and sixth ribs to the outer side, and a little below the middle of the left breast... I have had an opportunity of examining many times the bleeding of the head. Underneath the hair, which is soaked with blood and matted together, it is difficult to study the state of the skin; but to examine it on the forehead is, of course, easy. To complete this description we must record that the stigmata are painful. The extreme reticence of Louise has not allowed me to ascertain exactly the degree and the character of the pain; but by observing her features, her position, and her movements when not in ecstasy, I have satisfied myself that she must suffer acutely. The flow of blood normally ceases late Friday afternoon or evening at somewhat different hours. On the following day, Saturday, the stigmata are dry, and rather shining; here and there are seen some scales of dried blood, which soon fall off. It is unnecessary to add that there is no sign of suppuration. Louise, who on the evening before suffers much pain in using her hands and in standing, resumes very early in the morning her usual work, which she only interrupts in order to go and fulfill her religious duties at the parish church. The weekly ecstasies of Louise Lateau began on Friday, July 17, 1868—thirteen weeks after the first appearance of the stigmata. 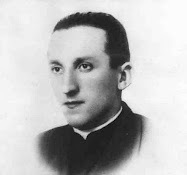 Nevertheless, Father Neils, Cure of Bois d'Haine , who has followed with as much intelligence as discretion the development of the phenomena, has remarked, before that time, certain passing raptures. He had kept note of them, but had not mentioned them to any one, and specially had he been careful not to talk about them with the young girl. The ecstasy recurs every Friday, commencing between 8:00-9:00am, and terminating towards 6:00pm; it has sometimes been prolonged until after 7:00pm. The ecstasy therefore lasts from nine to twelve hours without interruption. Louise has had raptures of lesser duration and of a different kind at the times of the great religious festivals of the year, either at home or, very rarely, at church, during the services. But as these passing raptures have had but few witnesses, and as I have not been able to study them myself, I merely mention them casually. The ecstasy which I am about to describe is that of the Friday. It can commence during a time of recollection and prayer, or sometimes while she is speaking, or even when at work. I have been present several times at the beginning of the phenomenon under these different circumstances, and can describe it in its details. It is important to notice that, from the moment that the eyes are raised and become fixed in contemplation, the ecstasy has begun. Louise no longer replies to those who speak to her; she is insensible to all outward stimuli. The ecstasy can also occur while she is working. I have not witnessed this, however a venerable American prelate, Mgr. 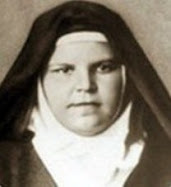 d'Herbomez, Bishop of British Columbia, having been authorized to see the young girl, presented himself at the little house on Friday, August 13th, 1869, towards 8:00am. Louise was working at a sewing-machine. The stigmata bled copiously both on her hands and feet; blood oozed from her forehead and head in a regularly-formed circle, and fell on her cheeks, temples, and neck: the sewing-machine was covered with it, and the young girl was evidently making most painful efforts to continue her work. While the bishop examined and questioned her, the noise of the machine suddenly ceased. Louise was then rapt in ecstasy. Many distinguished ecclesiastics, and quite recently Canon Hallez, professor at the Seminary of Tournay, have been witnesses of this sudden commencement. Note that work on Friday mornings was at this time imposed on her by a religious, who was instructed to study the facts from a theological point of view. He desired her to resist the ecstasy with all her might; and for this end, as a means of distracting her attention, he ordered work, in spite of the difficulties and suffering it entailed. The ecstasy is therefore proved. Let us try to describe her state exactly. During the greater part of the time Louise remains seated. The body, inclining slightly forward, rests on the edge of the chair, motionless as a statue; the blood-stained hands are laid upon her knees, concealed in the linen which is wrapped round them; the eyelids are unmoved, and the eyes gaze upwards, rather to the right. The expression of the young girl's face is one of profound and completely absorbed attention; she seems to be lost in far-off contemplation. The expression as well as the attitude frequently changes. At one time the features expand, the eyes become moist, and a radiant smile half opens the mouth. At another, the eyelids close, and half veil the sight; the face contracts, and tears flow slowly down the cheeks. Sometimes, again, she becomes pale, and an expression of extreme terror is seen, accompanied often by tremblings and a stifled cry. Sometimes the body slowly turns, and the eyes move, as if to follow an invisible procession. Sometimes, again, she rises, advances, and poising herself on tiptoe, seems about to hasten away. 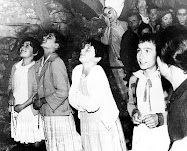 Her hands are raised, either joined or remaining outspread in the position of the ' Orantes' of the Catacombs. The lips move, she seems to pant for breath; the glance brightens; and this countenance, ordinary-looking before the ecstasy, becomes transfigured, and shines with a truly ideal beauty. Add to this spectacle the attendant circumstances of the stigmata; the forehead crowned with its bleeding circlet, from which the blood streams on to her temples and cheeks; the small white hands, each marked with a mysterious wound, from which pass forth, like rays, the tracks of blood—place in front of this wondrous spectacle groups of men and women of all ranks, amongst whom there is not a single figure which does not express respectful emotion—and you will have some idea of the scene of which we have often been the witnesses at Bois d'Haine. Towards half-past one, as the time of the scene of the prostration which I am about to describe draws near, Louise often falls upon her knees, her hands joined, and the body bent far forwards; her face assumes an expression of more and more profound contemplation. She remains in this position for about half an hour, rises, and reseats herself. Towards two o'clock the scene changes; she leans slightly forward, rises rather slowly; then suddenly, and as though propelled forward, falls with her face to the ground. Lying extended in this position on her chest, the head rests on the left arm, the eyes are shut, the mouth half open, the lower limbs perfectly straight, the dress covering them completely. At 3:00pm she makes a sudden movement; the arms extend themselves in the form of a cross, the feet cross over each other, the front of the right foot resting on the sole of the left. She remains in this position until nearly five o'clock. Then quickly arising, she kneels in the attitude of prayer. After some minutes of profound absorption, she sits again. The ecstasy lasts untul 6:00 or 7:00pm. The attitude as well as the expression continues to change; it seems to reflect different impressions of her soul. The ecstasy closes with a fearful scene. The arms fall on either side of the body, the head bows itself on the chest, the eyes close, the nose becomes pinched, the face assumes a deathly pallor, and is covered with a cold sweat; the hands are icy, the pulse absolutely imperceptible; the rattle is heard. This state lasts from ten to fifteen minutes, then life wakens again; warmth revives, the pulse quickens, and color returns to the cheeks; but for some few minutes longer the indefinable expression of ecstasy is there. Then, suddenly, the eyelids droop, the features relax, the eyes look gently from one person to another, and the ecstasy is at an end. On following attentively the different phases of the ecstasy, we are at once convinced that while they are in progress, the intellect, far from being deadened, is, on the contrary, in most active operation. Louise is quite unconscious of her external actions, and of what has passed around her, but recollects perfectly what has passed within her mind. On this point I have often questioned her. Her recollections are very clear and precise, but she always feels reluctance to relate them, and few have ever received her confidence as to them. 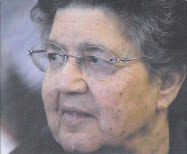 However, having been commanded by her bishop to answer all my questions, she has done so, simply, quietly, and clearly. According to her account, she finds herself, at the beginning of the ecstasy, surrounded by extensive and brilliant light; figures then begin to pass before her eyes, and the successive scenes of the Passion are displayed to her. She relates them concisely, but with a singular clearness. She sees our Savior. She describes His person, His clothing, His wounds, His crown of thorns, His cross. He pays no attention to her; does not look at her or speak to her. With the same precision and clearness she describes those by whom He is surrounded; the Apostles, the holy women, and the Jews. The functions of the senses are suspended. Let us examine them in turn. The pupils are dilated; we have already said that the eyes are widely open. At the beginning of the ecstasy, some slight and partial winking continues; but when the ecstasy is at its height the eyelids are altogether motionless, and during whole hours there is not the slightest winking to be observed. The eyes, fixed on the far distance, do not respond to ordinary stimuli; an object may be passed suddenly before them, or a bright light brought rapidly near them, without causing any movement of the lids or of the eyeball itself. Hearing, like sight, is in abeyance, or at least the ear is insensible to ordinary excitants. Several times it has happened that one of the observers placed behind her has suddenly shouted loudly in her ears, and never has the slightest start given evidence that the auditory nerve transmitted the perception. Sensation, in general, is almost entirely absent during the ecstasy. I say, almost entirely. This reservation is necessary, for there is in fact one part of the body where sensation continues in a slight degree— it is the conjunctiva. The conjunctiva is that delicate membrane which lines the inner surface of the eyelids, where it is rose-colored, and thence passes over the eyeball, where it becomes very thin and quite transparent. The persistence of sensibility in the conjunctiva explains a phenomenon which I have several times observed in Louise Lateau : a bright light may bo suddenly brought near the eyes without producing a wink; but if the open hand is rapidly pushed towards the face, as if going to strike it, a slight winking occurs; and this is caused by the impact of air on the conjunctiva. A similar movement occurs when this membrane is touched by the tip of the finger. I have often passed a large pin right through a fold of skin of the hands or forearm, and this I could only do with an effort and a boring action. I have left the pin thus buried in the thickness of the skin, and have pushed it in different directions. At other times I sharply thrust the point of a pen-knife into a limb, and often so deeply as to make blood come. 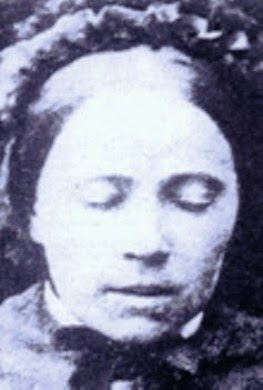 To be absolutely certain that the young person should not be able to foresee my intention, and prepare herself in some manner to suffer the pain and brace herself up, I remained for some time quite still behind her chair, and then suddenly pierced the skin of the nape with the pen-knife, so as to make the blood spurt out. All these trials ended in the same result, viz. that neither I nor any of the medical men, or the other witnesses of these experiments, succeeded in detecting the slightest indication of sensation, or, in particular, the slightest contraction of the muscles. When I undertook these experiments, rather cruel in their nature, I felt satisfied that the ecstatica was perfectly insensible, and consequently felt no pain from them. A remarkable fact, and one which I have verified several times, is, that contrary to a well-established physiological law, whilst the pulse quickens more and more the respiration grows slower in the same proportion. Dr. Imbert Gourbeyre has also observed this peculiar circumstance. He has noted the gradual rise of the pulse from 90 beats per minute to 130 ; whilst the number of the respirations fell from 18 to 10. As the respiration thus becomes feeble, and the pulse diminishes to a scarcely perceptible thread, the temperature of the skin becomes lower, and a cold perspiration breaks out. As already mentioned, reaction occurs at the end often or twelve minutes; the pulse regains its normal strength and frequency; the respiration rises again; the skin returns to its usual warmth. The young person reenters ordinary life from the world of ecstasy without any transitional period. She does not complain of muscular soreness, nor of headache, nor of any inconvenience whatever. The body is active, the features composed, the look calm and clear, the intellect bright. The idea of a fraud has never been credited by those who know Louise Lateau. Her upright conduct, her simple and modest piety, her heroic charity, are in their eyes the very opposite of hypocrisy. The case could not be the same for those to whom Louise was a stranger. The first impression produced in their minds by the recital of these occurrences was one of distrust. It was generally suspected that this was some pious fraud which the first glance of science would be enough to detect. I make no difficulty of confessing that I was altogether under this impression when I entered, for the first time, the little house at Bois d'Haine. This doubt was natural, legitimate, and in fact necessary; but it soon disappeared on contact with the facts. If we regard only the production of the stigmata, the first difficulty that fraud would have found would have been to procure what was necessary to produce the wounds. Since the commencement of the phenomena the eyes of the public have been directed to all the actions of the young persons and of their mother. How could they buy, without betraying themselves, blisters, caustics, instruments, anything? For, indeed, we must acknowledge that they would have to resort to several operations, since, not to mention the stigma of the breast, the blood escapes from the forehead by abrasions; from the hands and feet by vesicles. But let us waive this difficulty, and suppose that Louise Lateau possesses all the apparatus necessary for her work of deception; how will she, a young uneducated girl, assisted, if you will, by two or three accomplices as cunning as herself, proceed in order to cause a phenomenon that the physician with his special knowledge and the resources of his art cannot accomplish ? It is a question, in fact, of making the blood flow from nine or ten parts of the body, keeping up the flow for half a day, often for longer still, under the eyes of witnesses who would not allow any touching of the healing surfaces for the purpose of opportunely reopening them. But the impossibility of fraud is much more evident still when the ecstasy is considered. How, in fact, can we suppose that a young girl brought up amidst the hardships of manual labour, debarred from all education, who has seen nothing and read nothing, can act, every week, for a whole day, scenes which would require the consummate skill of a professional actress; that she can simulate paralysis of the senses, and, in particular, a complete insensibility to the most painful irritants; that she can control at pleasure functions which are in their very nature beyond the power of the will; that is to say, that she can quicken or retard the heart-beats, raise or lower the temperature of her limbs, retard and even suspend those excretions which constitute the most humiliating, and at the same time the most convincing, evidence of human weakness. It is evident, then, that even if the problem of Bois d'Haine had only one unknown quantity—either stigmatisation or ecstasy-—it would be very difficult, if not impossible, to find its solution in the hypothesis of fraud. But the question becomes singularly complex when the endeavour is made to account for these two facts at once, facts nevertheless connected together, which we cannot logically disjoin, and which must be taken together and explained together. How can we suppose that this young girl carries on at the same time two almost contradictory frauds? —that is to say, that she counterfeits the ecstasy with the immobility and insensibility which characterise it, and produces the haemorrhage from the stigmata, which would need frequent renewing by some process or other in order to continue for ten, fifteen, or twenty hours? How can we suppose that she has played this double part, without ever betraying herself, for nearly five years, at one time in solitude—yet not a safe solitude, for unexpected visitors might always surprise her—at another time before the eyes of the public ? On February 11, 1870 I was passing across the parish of Bois d'Haine quite unexpectedly. As it happened to be a Friday, I wished to see Louise again. I knocked at the little house, which was at once opened to me; and crossing without delay the common room, where her two sisters were at work, I went straight into her little room. It was a quarter to four o'clock. Louise was quite alone; she was prostrate on the ground, her arms extended in form of a cross, insensible, and completely unconscious of anything going on around her. The pieces of linen which had been wrapped round her bleeding stigmata were still there. I counted nine of them. The blood which had streamed from her forehead had dried, and formed various figures, some extending to her cheek; the small white head-dress which covered her head was marked with irregular -red stains, forming a half circle, which completed the forehead's bleeding crown. I took off the headdress, and saw that the blood had flowed from points very numerous, and near together, describing around the head a complete circle, which passed across the middle of the forehead. The feet had not bled. In the right hand the flow of blood had just ceased; the clots were still soft; in the left hand a thread of blood continued to escape from the dorsal, as well as from the stigma on the palms. After having examined these different points, I left the cottage. I need not say that Louise was not conscious of my visit. On Wednesday, February 3,1869, at four o'clock in the afternoon, Dr. Lecrinier de Fayt, M. Niels, cure of Bois d'Haine, and M. Henri Bussin arrived at the house of Louise Lateau. They brought with them leather gloves, thick, strong, well sewn. After ascertaining that both hands were in their normal condition, and especially that there was no unusual redness, no sign of vesicle, the young person was asked to put on the gloves. They fitted exactly. A stout ribbon fastened round the base of each glove served to bind it closely round the wrist. The glove having been put on, and the ribbon passed five times round the wrist, so as to leave no space between the glove and the limb, the two ends were tied in a double knot and cut off one inch from it. The ends of the knot were then covered with melted sealing-wax, which was stamped on either side with a special seal. To prevent the seals from being broken by any accidental blow or friction, they were enclosed in little Linen bags. The arrangement was the same for both hands, except that the ends of the two first fingers of the right glove were cut, so as to uncover the ends of the thumb and the first finger, in order that Louise might go on with her work of sewing. On the following Friday, before seven in the morning, I was at the little house at Bois d' Haine. I met there, as agreed, the witnesses who had applied the gloves and also Monsignor Ponceau, vicar-general of the diocese of Tournay, and two Belgian doctors, Dr. Moulaert of Bruges and Dr. Mussely of Deynze. Each one of us carefully examined the apparatus, ascertained the perfect integrity of the seals, the ribbon, and the gloves; and made sure that it was impossible to slip any instrument over the front or the back of the hands. These points having been determined, I cut the ribbons and removed the gloves. They were quite full of blood: the hands were steeped in it. 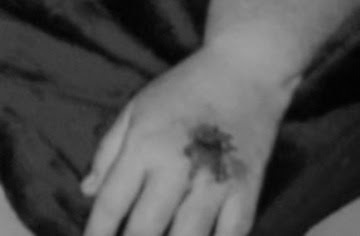 After having washed them in warm water, we found the stigmata in the same state as on other Fridays : on the palm, as well as on the back of each hand, the epidermis was raised; it was torn and had left bare the surface of the true skin ; each of the stigmata continued to bleed as usual. With regard to the feet, which had not been subjected to any special precaution, the right was bleeding copiously, the left was dry. It is perhaps not impossible to make an objection, a very far-fetched one, no doubt, but one which we must not pass over. It may be said, "Louise learned, through some one's indiscretion, the experiment that was intended, and on Wednesday, before the coming of the witnesses, she applied to her hands the unknown agent which causes the formation of the vesicle and afterwards the hemorrhage." In other words some could say that she reasoned, "The vesicle will form too soon, the blood will flow before the usual day, but the glove will hide both vesicle and blood, and appearances will be saved." 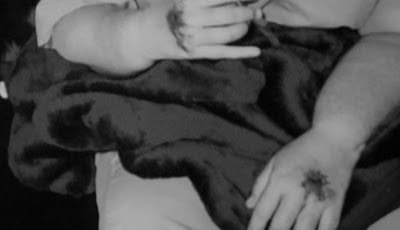 An experiment made under other conditions, and with other witnesses, pointedly answers this objection: the gloves were fastened on, on a Tuesday, with the same excess of precautions, and removed for a few moments twenty-four hours afterwards ; the perfect integrity of both sides of the hands was ascertained, and then the gloves replaced. On Friday morning the bleeding occurred from the stigmata of each hand as copiously as iisual. These considerations and these experiments warrant me in concluding that there is not the slightest possibility of fraud producing the haemorrhage of the stigmata. It would be easy to demonstrate by similar (physical) proofs that the ecstasy of Louise Lateau cannot be feigned. Let it suffice to call to mind the repeated tests, and especially the electric stimulation, to which I subjected her in order to satisfy myself of the insensibility which, from a physiological point of view, is the characteristic of this state. There is no physiologist who does not recognise, with me, that unless the loss of sensation were complete, the organism would, by a quivering or some other reflex movement, answer to the painful irritation of electricity. The facts of Bois d'Haine are therefore genuine and true. In the presence of the moral, the physiological, and the material impossibilities which I have pointed out, the hypothesis of fraud must be absolutely rejected. The reader will immediately see that the fact I have selected belongs to an order of facts which I promised not to discuss, because they belong primarily and specially to the domain of theology. [As he stated at the beginning of this article, being a medical physician Dr Lefebvre was inclined only to study the medical phenonmenon occuring in the life of Louise Lateau -editor] Let me defend myself, therefore, by a word of explanation. I do not propose to draw from the fact I am going to relate any theological conclusion whatever. I only introduce it here because it throws great light on the objection drawn from the phenomena of clairvoyance, which those who uphold the theory of the occult sciences as explaining the facts of Bois d'Haine are continually urging against us. With this word of apology, I proceed to narrate my fact. I take it from the reports written by two eye-witnesses ; the one, one of the most eminent statesmen of our country, M. Deschamps amd the other, Monsignor d'Herbomez, Bishop of British Columbia beyond the Rocky Mountains. 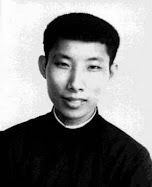 This venerable prelate has passed twenty years of his life in evangelizing the savages, in the midst of very cruel privations and unceasing dangers. His knowledge is equal to his piety and his apostolic zeal. 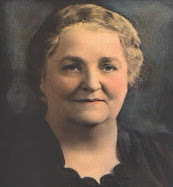 I have already had occasion to mention6 that this Bishop, having obtained permission to see Louise Lateau, was admitted into the cottage on Friday, August 13, 18G9. He was accompanied by M. l'Abbe Mortier, Rector of the College of Bavay. Let me briefly remind my readers that they found the young girl busily engaged in directing the movements of her sewing-machine. Blood was flowing abundantly from her feet, hands, side, and all round her head. The Bishop entered into conversation with her, and was questioning her visions. She answered in her ordinary quiet manner, but with perfect intelligence. Presently the machine stopped all of a sudden; the girl's hands remained motionless, and she was in an ecstasy. The Bishop and his companion followed the various scenes of this ecstasy all through the day, and have described them in their report; but they need not be repeated here, as the reader is already familiar with them. They tried several experiments with relics and other blessed objects. About ten o'clock they were joined by the parish priest, on his return from administering the last sacraments to a poor old woman in the neighborhood. It is necessary to explain that country priests in Belgium sometimes carry the Blessed Sacrament and the holy oils in two separate compartments of the same silver vessel; that is to say, the two parts of the vessel may be separated at will, and the part which contains the Blessed Sacrament is called the custode (in England, the pyx); but ordinarily they are united, and this double vessel is carried from place to place in a silken burse. As the cure had communicated the sick woman with the only Host which the pyx contained, he supposed—and so also did the Bishop and his companion—that there was now nothing in the sacred vessel but the holy oils ; otherwise they would not have dared to break the laws of the Church by making the experiment I am going to relate. M. l'Abbe Mortier (the experiment was made by the Bishop and the Rector alternately)' wished to present the box of holy oils to the lips of Louise. When he was about two yards from the chair on which she was sitting, she experienced an extraordinary movement of most lively emotion and a transport of gladness. She got up, and fell suddenly on her knees in an attitude of adoration, her hands joined, starting forward and stretched towards the sacred vessels; her figure was quite seraphic. The Abbe retired a little, but still retaining the blest object in his hands, and she followed him as he slowly withdrew. She seemed to be half kneeling, half standing, leaning forwards with her hands elapsed; she looked like one drawn by a magnet, and as though she was gliding rather than walking. In this way both the Rector and the Bishop made the complete circuit of the room; whenever they stopped, she fell on her knees and adored. When they got back near to her chair, they withdrew the sacred vessels to a distance from her, whereupon she sat down, returned to her previous state of immobility, and the usual scenes of the ecstasy were continued as on other Fridays. Monsignor d'Herbomez thought that some particle of the Blessed Sacrament must be still remaining in the pyx without the knowledge of the parish priest, who perhaps had not had time to make the usual purification of the sacred vessels. To satisfy himself on this point, he separated the two parts of the vessel, and then offered the part which contained the holy oils to Louise. He found that he could do this without causing her to make any unusual movement; and even when he touched her lips with it, she only gave a gentle smile, as she does whenever she comes in contact with objects that are blessed. But when he presented the other portion, or pyx, even at the distance of two yards from her, the whole scene which I have just described was repeated—the kneeling, the adoration, and the transports of delight. They left the cottage five hours later, and all four went together to the parish church, where the Bishop opened the pyx in the presence of the other witnesses, and they found that a considerable particle of the sacred species had been left in the sacred vessel. Such is the fact, affirmed by men whose testimony is above all suspicion, and it may be added that there were three other witnesses also, the mother and two sisters of Louise. In thinking over this very wonderful fact, one objection continually presented itself to my mind. 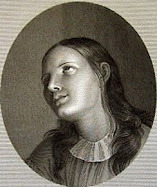 I know how strongly the partisans of magnetism are disposed to believe in the reality of the phenomena of clairvoyance, however improbable; and I considered that they would certainly claim for Louise an exceptional degree of that power; they would say that she had recognized the sacred vessels in their usual covering of silk, and that she had even seen, by means of her exceptional powers of clairvoyance, the holy oils in their silver box, and the fragment of the Host in the pyx. This doubt has certainly no great claim to be considered as a scientific doubt; nevertheless, I was anxious to remove it, and I therefore asked for another experiment by way of counter-proof, and it was made under the following circumstances. On Friday, November 19, 1869, at 9:00am, the parish priest, accompanied by Canon Halley, a distinguished professor of the seminary of Tournai, entered the cottage of widow Lateau. Louise was already in her ordinary ecstasy. The priest had brought in the same silken burse as before a little silver vessel exactly like the pyx, and in it was an unconsecrated Host. Here, then, was the very same outward apparatus (so to speak) as Monsignor d'Herbomez had held in his hands on the former occasion. 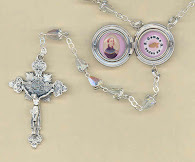 I said to myself, therefore, 'If Louise is a clairvoyant, she will recognize those things which are used for the administration of the Sacraments to the sick; she will see the burse, the pyx, and even the Host that it contains. She will immediately believe that the Blessed Sacrament is here, and we shall have a repetition of the scenes of adoration which have been already described.' The parish priest offered the vessel to Louise, but she made no manifestation, no transport of joy, no act of adoration; she remained absolutely insensible and immovable. 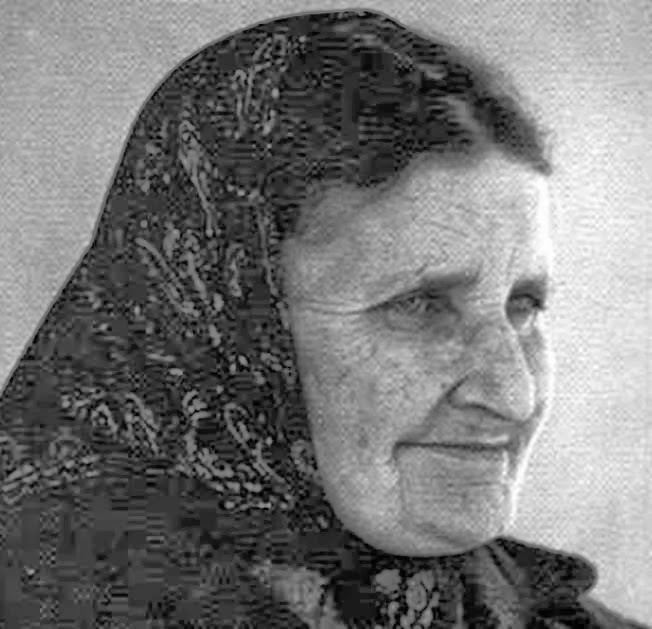 The Servant of God Anne-Louise Lateau died on August 25, 1883 at age 33 -the same age as her beloved Jesus. 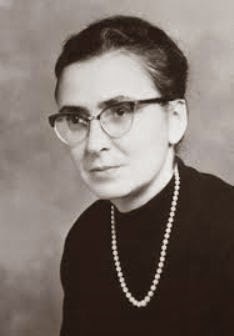 In 1991, the Cause for her Beatification was officially opened in Rome. I am a believer in Louise Lateau... like most stigmatics, she was the recipient of many remarkable favors from the Lord during her short life. 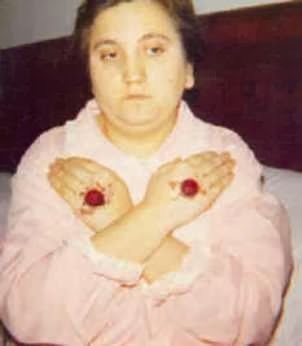 Over ten years ago, an elderly priest who was involved with her Cause for Canonization, shared an old holy card with me that had a piece of bandage attached to it, soaked with blood from Louise's stigmata. The blood still appeared moist and it caused a watery stain to form on the card that slowly got bigger. I eventually had to laminate the card to prevent it from falling apart since the moisture had made the paper very soft. 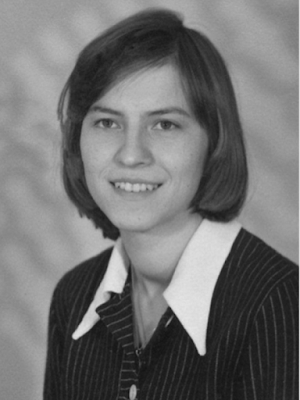 The whole situation has me mystified but completely convinced that Louise was truly a privileged soul. 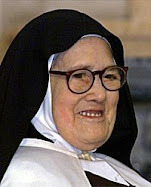 Thank you for your comment about the special holy card of Louise Lateau. If possible, can you please email me a photo of this holy card? I would love to be able to add it to this article and also the other article that I have written about Louise. 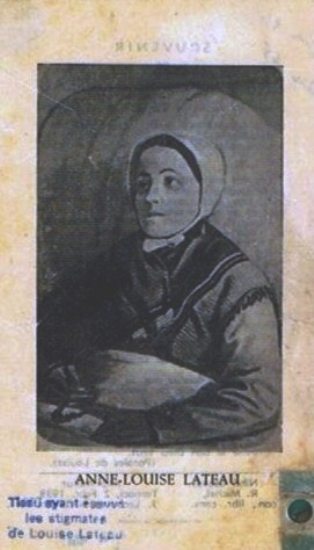 Peter at the Guadalupe House Blog kindly shared a photo of a holy card of Louise Lateau, and I added the photo to the article above--it is the photo at the bottom of article. Attached is a photo of the holy card that I have of Louise Lateau... the "relic" - a small piece of bandage soaked in her blood - is attached in the circle at the bottom-right. When I first received the holy card, the yellowish stains around the top and bottom of the card were there, which I attributed to the aging paper... but there's actually another watery stain that goes up the right of the card, which wasn't there. When I first noticed the new stain, it wasn't so large and it was above the bandage area. I wondered if I had some sort of liquid on my home altar that had caused the watermark, but as months passed, the stain slowly got larger until it was halfway up the right side of the card. I made sure there wasn't any source of moisture on my altar so I was really perplexed by the growing stain. Furthermore, the paper really seemed "damp" and the small piece of bandage itself appeared as though the blood was still moist. To keep the card from falling apart from the moisture, I laminated it to protect it - it still appears damp under the plastic. I'm not exactly sure why this happened... but I've read about at least one instance of blood from a stigmatic being collected and then liquifying on certain occasions after the holy person had passed on. 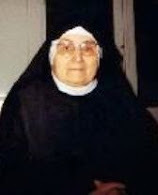 I am referring specifically to a little-known Servant of God, Sr. Passitea Crogi, who was a Franciscan nun marked with the wounds of Christ. 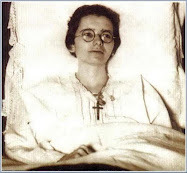 Her blood was collected into small vials by her fellow nuns during her ecstatic sufferings and they reportedly liquify on certain feast days of the year, up to the present time. Perhaps it's a similar phenomenon. Whatever it is, it has me convinced that it is some sort of sign that confirms Louise's sanctity and the supernatural origin of her stigmata. Anyway, God's blessings to you and your online ministry. I just discovered this web site a little while ago. 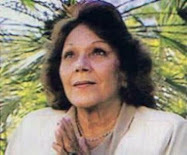 This is such a wonderful and uplifting collection of articles on the mystics! Most of these have heretofore been wholly unknown to me, and I can't stop reading. But I find it so sad that all these astounding examples of purity, holiness and suffering have been kept so hidden. I hope the contents of this web site could some day be put into booklet form so they could be distributed at church. I know others who would profit greatly by reading the lives of the recent saints. I have an odd question: I remember someone told me long ago that all those who receive the stigmata asked to receive it. Can anyone confirm or deny this? Is there any record of any stigmatic who has ever mentioned requesting the stigmata? It doesn't really sound like something they would do; it would seem out of character with their abject humility (but what do I know?). Well, as the webmaster of this website I can honestly state that I have studied the lives of roughly 60 or so mystics, (a good number of which are on this website), -the majority of them being stigmatics, and I have never come across a single one that asked for the stigmata. In fact I very much agree with you that such a request would run contrary to the humility and sense of unworthiness that would be necessary if one was to be given such a significant spiritual gift as the stigmata. Saints never ask for mystical gifts and graces because such a request runs contrary to humility and to seeking not one's own will and desires, but only seeking the will of God.